Summit Pilsener - AoM: Beer et al. The other day I had a Summit Oktoberfest and today I tried the Summit Pilsener. 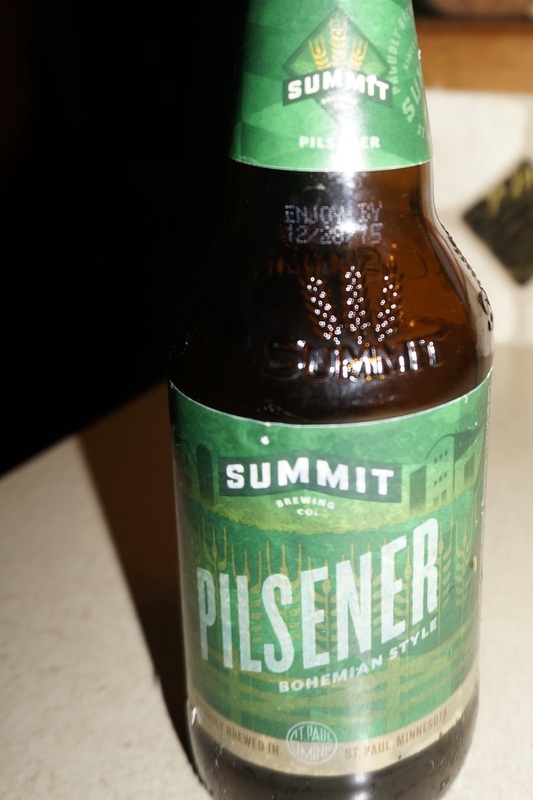 As far as pilseners go, the Summit Pilsener was real refreshing. It had a nice taste down to the last sip. I later had a bottle of the Summit Great Northern Porter and felt the Summit Pilsener was more consistent. Authentic Saaz hops from the Czech Republic give our Pilsener just the right amount of spicy floral aroma. With a crisp, refreshing malt backbone and lightly spiced hops, it’s a taste of the Bohemian life. Now available in 12oz cans! Brewed exclusively with two-row Moravian 37 barley grown on the North Dakota family farm of Summit Founder Mark Stutrud’s cousin Jim and his son Todd. 40-45 degrees °F in a Flute, Slender Tulip/Pokal, or a Stange glass.